D&D Leasing, originally formed in 2000 in Canada to support SMEs through the acquisition of assets, has changed its name to DND Finance. Co-founder Rev. Dr. K. Bill Dost explained that he had felt the business had come to a crossroads. D&D Leasing was in essence no longer just a leasing company, offering loans, professional loans, equipment leases, vehicle finance and now a credit card. The rebrand also comes with a new appointment. Tara Skewes, a long time DND team member was announced as President of the Canadian Operations effective from 1 January 2019. The appointment allows Dost to continue to seek out new opportunities and to continue to grow the company while ensuring that the day to day operations were not being neglected. 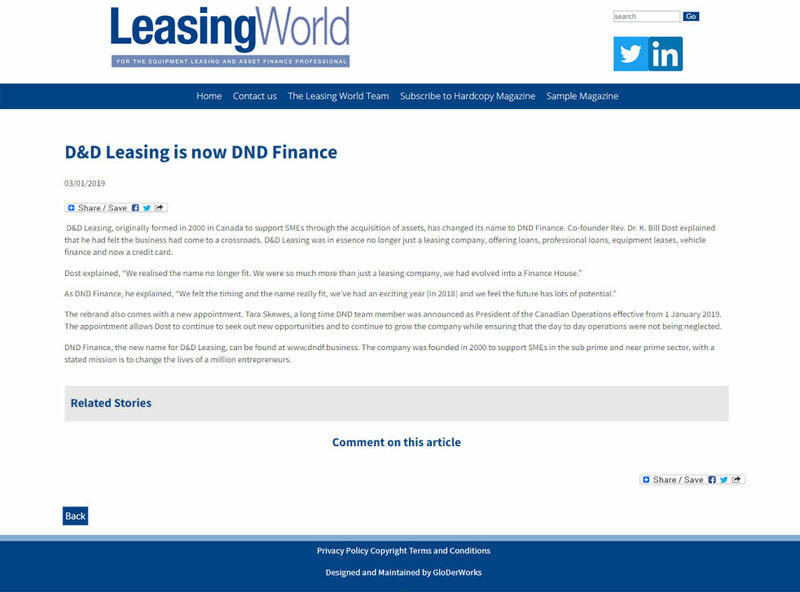 DND Finance, the new name for D&D Leasing, can be found at www.dndf.business. The company was founded in 2000 to support SMEs in the sub prime and near prime sector, with a stated mission is to change the lives of a million entrepreneurs.